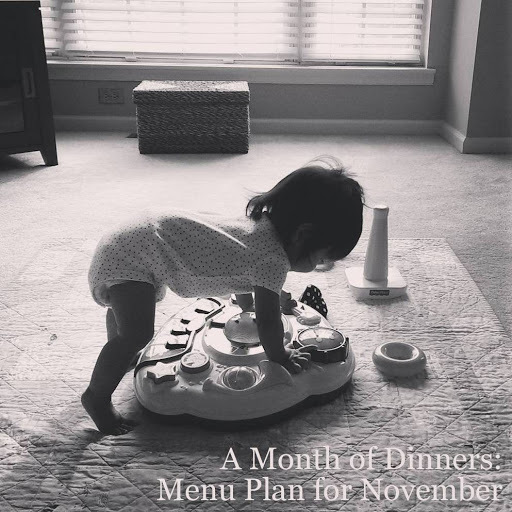 In an attempt to make my life a little easier, I'm planning all of our dinners for November at once. Seeing as this is only the third post I've written in October, I think it's safe to say that this was a rather slow month for me on the blog. I had grand plans of maintaining the momentum I had gained back in September, back when I managed to churn out nine blog posts with an infant in the house, but it just wasn't meant to be. I expected to get more and more annoyed at myself for not making time to sit down and write, but I never did. Every time I realized I wouldn't have time to write at the end of the day, I simply shrugged my shoulders and accepted the fact that we, as a family, were super busy this month. With a trip to Cleveland (where Caroline crawled for the first time [!] and got to meet one of my closest friends from grad school), visits with all six of the grandparents (and one great-grandparent), and an afternoon of fall fun at the orchard, life offline took precedence, and I allowed myself to just enjoy it. I know that's a risky thing for a blogger to admit, but I truly benefited from the time away. I didn't overload my schedule, so the time I spent doing other things was more meaningful because it was more focused. For now, though, how about we focus on our menu plan for the coming month?